Kayak Crete and the The Northwest Passage have led paddling adventures along the coast of south crete for over twelve years. Spend your days on the crystal-blue Libyan Sea . 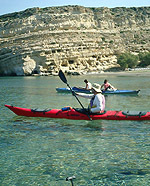 Enjoy a world-class sea kayaking trip amid magnificent mountains and Minoan ruins. The friendly, hospitable small towns of Crete's southern coast, and warm, sparkling seas invite you to explore. No Experience Necessary! For detailed information about specific trips please click on a destination below and let your adventures begin today!